To estimate the risk of developing chronic musculoskeletal pain in different body regions from varying degrees of perceived physical exertion during healthcare work. Prospective cohort study among 4,977 Danish female healthcare workers responding to a baseline and follow-up questionnaire in 2005 and 2006, respectively. Using multi-adjusted logistic regression analysis, the risk of developing chronic pain (>30 days last year) at follow-up in the low back, neck/shoulder, and knees—among those without pain (0 days last year) in these respective body regions at baseline—from moderate and strenuous (reference: light) perceived physical exertion during healthcare work was modeled. Adjusted for age, BMI, tenure, smoking status, and leisure physical activity, strenuous perceived physical exertion during healthcare work increased the risk of chronic low back pain (OR 3.16, 95 % CI 1.79–5.57) and chronic knee pain (OR 1.87, 95 % CI 1.19–2.94) at follow-up among those without pain in these respective body regions at baseline. With additional adjustment for psychosocial work conditions, only the risk of developing chronic low back pain from strenuous physical exertion remained significant (OR 1.99, 95 % CI 1.02–3.88). Strenuous physical exertion was not a risk factor for chronic neck pain, and moderate physical exertion was not a risk factor for chronic pain in any of the body regions. 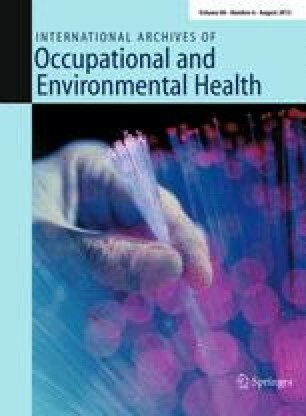 Strenuous perceived physical exertion during healthcare work is a risk factor especially for developing chronic pain in the low back. The possible preventive effect of reducing strenuous physical exertion should be tested in randomized controlled trials. The study was supported by a grant from the Danish Parliament (SATS 2004).